A miniature statue of the Illinois Centennial Monument Statue will be available this summer. LOGAN SQUARE — Logan Square residents will soon be able to take a little bit of the neighborhood into their living room. The most visible symbol of the neighborhood, the Illinois Centennial Monument, is being replicated and will be available in table-top size. 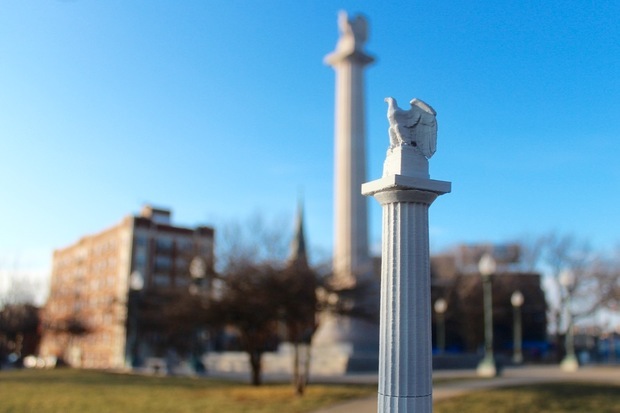 Later this year, thanks to a partnership between Logan Square Preservation and the Chicago Public Library, miniature statues of the monument will be available for about $50. The miniature monuments will be one result of the high-tech 3-D laser scan that was conducted in the fall. The scan was intended to provide a check-up on the structural integrity of the 98-year-old monument. It also provided Logan Square Preservation with a digital model of the monument at the center of the neighborhood that the organization turned into a miniature model. Though the original monument is made of marble, the miniature version instead will be a marble resin — and about 15 inches tall. "The final version will look very much like you've taken the monument itself and shrunk it," said Andrew Schneider, president of Logan Square preservation. The original model was created in the Chicago Public Library's maker lab on a 3-D printer. Because of the size, the model was constructed in five separate parts, topped with the Eagle. "It sounded like a really cool project and having to do with local history, so I was really into it," said Sasha Neri, a Chicago Public Library librarian who works in the Maker Lab. The finished model statue is being sent to a manufacturer over the winter for an initial run of 200 copies. This was one of the first times the library has worked with a neighborhood organization on a project since the Maker Lab opened in 2013. The lab, which has a handful of 3-D printers and two laser cutters, is open to the public. The cost to print is $1 for 30 minutes of 3-D printing with a two-hour max. "It's one kind of really cool resource that we have available to the public and it's just one of many ways that an organization can use this and learn something new and do something really cool," Neri said. The statues are expected to be finished and sold this summer. Proceeds from their sale will go toward renovation and preservation efforts of the monument and the square. The monument was designed by Henry Bacon with the sculptural base by Evelyn Longman. It was dedicated in 1918 to mark Illinois' 100 years of statehood.